Free Download Luxor Bundle Pack Game or Get Full Unlimited Game Version! Destroy Set's spheres before they reach the pyramids and guide your scarab to victory in this adventure across ancient Egypt! In order to get advantaged of playing Luxor Bundle Pack full unlimiteg game version you must register the game. In this two-game pack, Isis has enlisted your help to battle against Set and his evil minions. 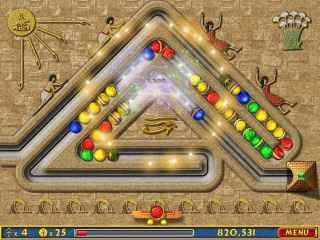 Use your mystical winged scarab to shoot colored spheres and make matches of three or more. Stop them all before they can reach the pyramids at the ends of the paths or all of Egypt is doomed! Use the magic of Isis to catch talismans, gems, and Ankh coins. Unique power-ups, fun gameplay, and an original musical score make this game hard to put down. Are you ready to thwart Set's diabolical plans? This bundle pack contains two games, Luxor and Luxor: Amun Rising, for the price of one! Two games for the price of one! Enjoy two fun and exciting seasons of The Hidden Object Show! Win virtual prizes and enjoy addicting mini-games! As addictive as it is exciting, Luxor is an action-puzzle game that takes you on a thrilling adventure across the lands of Ancient Egypt! Luxor 2 takes you on a beautiful voyage through 88 all-new, gorgeously rendered levels set amongst the pyramids of ancient Egypt! Embark on an ethereal mission using your match-three skills to release the essences of some of the most powerful Egyptian gods of all time! Experience LUXOR like never before in LUXOR HD! Answer the call of the goddess, Isis, in this gripping Marble Popper!